During World War 2 the combatants produced countless types of tanks, military transport, self-propelled guns and other specialised military transport for use against the enemy. Some of these types were successful; others were less so. But all, however, played a role in the unfolding drama of the war. The first tank supplied to Britain from the USA under Lease-Lend was the M2A4, but this was only used for training. From this type the M3 was developed although many features of the M2A4 were retained. Designated Stuart 1 by the British Army it was nicknamed 'Honey' by tank crews on both sides of the Atlantic. There followed a slightly improved version, the M3A1 (Stuart II), which was still powered by a Continental radial air-cooled aero-engine. Improvements continued with the M3A2 (Stuart III) and the diesel-engined M3A2 (Stuart IV). The final model, the M3A3 (Stuart V), featured an all-welded hull. The tank saw action in the Soviet Union, Western Desert and in the Pacific theatres of operation. 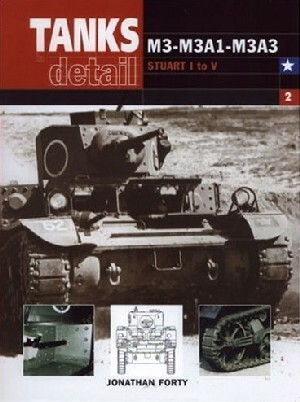 Designed with the modeller, preservationist and wargamer in mind, Ian Allan Publishing's new 'In Detail' series is intended to provide the reader with a comprehensive history of the type of tank, self-propelled gun and military transport featured. Each volume will include a detailed history of the unit in service, along with information on variants, markings, unit allocations etc. Alongside the comprehensive illustrative section, which will include details shots of models in colour, the books will also include scale drawings and comprehensive guidance notes on camouflage.